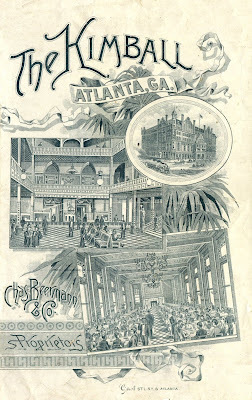 The Kimball House was the best hotel in Atlanta. Situated on an entire city block at the south-southeast corner of Five Points, it had recently been rebuilt, opening on New Year’s Day in 1885. 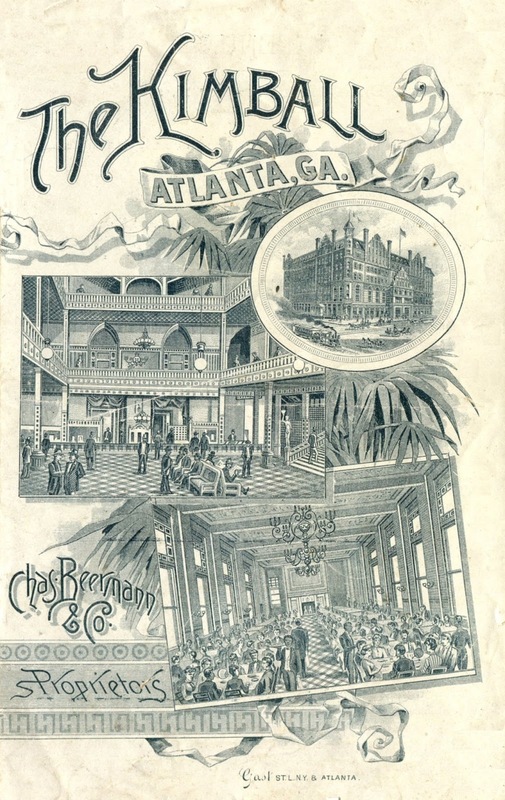 The new seven-story building was much larger than the original structure, comprising thirty-one stores, twenty-two public rooms, and 357 hotel rooms.1 The cover of the menu shown below provides several views of the hotel. There is almost no French on the bill of fare and the regional influences are muted. 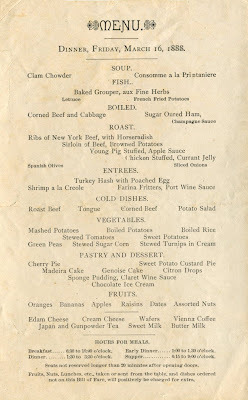 The presence of New York beef, which was often served at luxury winter resorts in the South, signals that it was a first-class establishment. 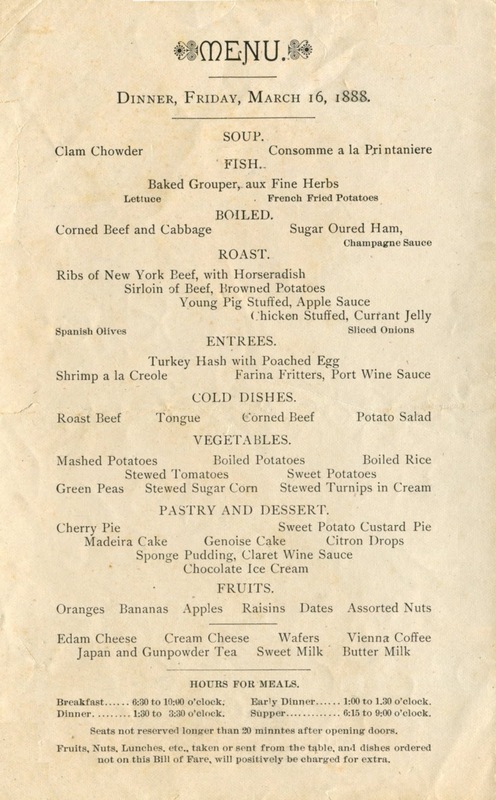 Still, the modest entrées seem to echo the reality of everyday life after the Civil War. In truth, the cuisine is outclassed by the excellent wine list, then a standard feature at such hotels. 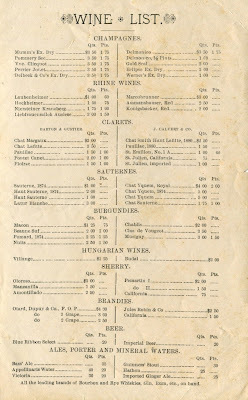 Although a menu marks only a moment in time, it can stimulate a process of discovery. This one raises many questions. Frazier was known to be a leader who trained and encouraged those who worked under him. Where did he serve his apprenticeship? He hailed from Charleston, a city with a long line of outstanding African-American caterers and chefs. 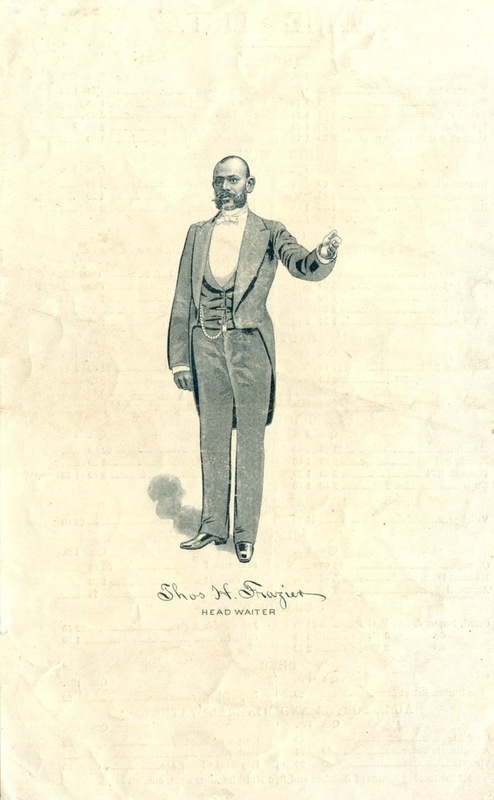 It is also interesting that Frazier worked at fifteen hotels over the course of a career which encompassed the tumultuous 1890s.3 In addition to strikes by restaurant and hotel waiters and a severe economic depression, black waiters were marginalized by new ideals of servitude during this period when wealthy Americans began to identify with the European aristocracy. How these seismic events might have affected him is not known. 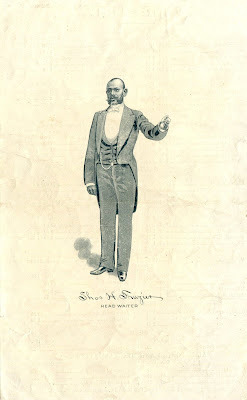 When Frazier died in 1903, he was the headwaiter at the grand Chittenden Hotel in Columbus, Ohio. At the time of his death, it was said that he enjoyed an “exceedingly happy” family life and was a valued member of the Head and Second Waiters’ National Benefit Association. 1. The Kimball House was bounded by Whitehall Street (now part of Peachtree Street), Decatur Street, Pryor Street, and Wall Street. 2. Atlanta Constitution, 17 October 1895. 3. 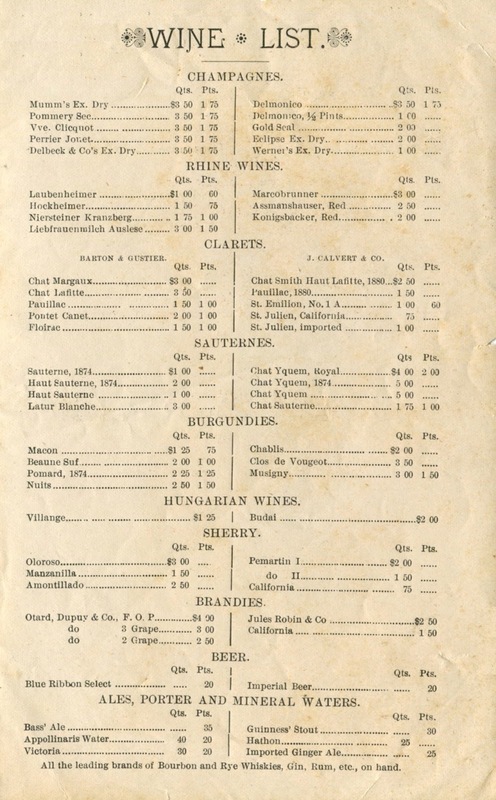 In addition to the Kimball House and Chittenden Hotel, Thomas Franzier was the headwaiter at the Portland Hotel, Portland, OR; Endicott Hotel, New York City; Great Northern, Chicago; Leland Hotel, Springfield, IL; Indian River Hotel, Rockledge, FL; Leon Hotel, Tallahassee, FL; Hot Springs Hotel, Hot Springs, NC; Ocean House, Newport, RI; The World’s Inn, Chicago; Great Southern, Columbus, OH; Hanover Hotel, Philadelphia; Gladstone Hotel, Narragansett Pier, RI; and the New Grand Hotel, Catskills, NY. Love reading these Henry. Hope all is well.